It has been reported that a 10 year-old cyclist died on Monday, July 23, as a result of the injuries sustained after being struck by a motor vehicle in west suburban Broadview. The collision occurred on 25th Avenue, north of Cermak Road in the mid-afternoon of that Sunday of July 22. According to preliminary reports, the 17 year-old motorist was allegedly driving southbound on 25th Avenue when the crash occurred. No information has been released about the direction in which the cyclist was heading. No citations or charges have been issued. Although further details surrounding the investigation have not been released, upon analyzing aerial and street views of the intersection at which the bicycle accident occurred, there are some issues of interest. 25th Avenue has a stated speed limit of 35mph. However, there are no traffic lights from 26th Street to Roosevelt Road (Roosevelt Rd is north of Cermak Rd), a distance of approximately 1.5 miles. This long stretch of asphalt plus the lack of any traffic lights could potentially contribute to speeding. 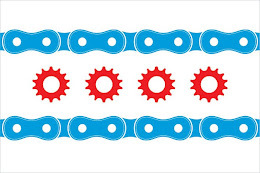 According to the statistics compiled under the Chicago Forward plan, a cyclist struck by a motor vehicle traveling at 30mph has about a 55% chance of surviving. An increase in speed of just 10mph significantly reduces a cyclist surviving a car collision to just 15%. Under Illinois law, children under the age of 12 are permitted to ride on most sidewalks. The victim was 10 years old. No information has been released of whether the victim was on a sidewalk or the street when the collision occurred. Upon passing Cermak Rd, there is a stretch of sidewalk that abruptly ends at 22nd Street. In addition to the potential use of the sidewalk, from 26th Street to Cermak Rd, there are gravel shoulders marked for bicycle use. Heading north on 25th Avenue from Cermak Road to 22nd Street, vehicles are passing underneath a bridge that may briefly deteriorate clear visibility of the road. Within that defined length of road on 25th Ave is the short stretch of sidewalk. Always ride safely and with great caution.